Whether they are flat, cylindrical, rectangular, conical or cubic, wooden blocks are used to form objects. Children enjoy building houses, department stores, hospitals, schools and other buildings. They either spread them out on the floor or construct them on a three-dimensional basis. 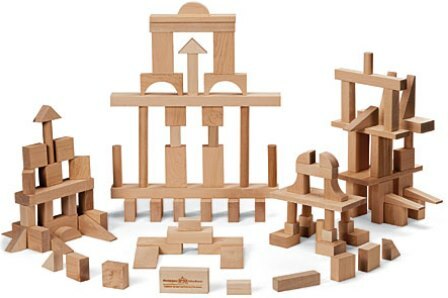 Wooden blocks don’t have hinges that connect them to each other. Kids therefore learn the concept of balance, the value of considering small details and the attitude of patience. You can make one tall building together to foster teamwork and camaraderie. Through this, you would know who has leadership qualities, who are cooperative team players and who bums around. Then you can gather around it, act like the wolf in the Three Little Pigs traditional tale and blow it hard. When the building has fallen down, laugh out loud together and rebuild it again. You can also ask them to build a specific building on their assigned area. When everyone’s finished, provide each of them a car and allow them a few minutes to go joyriding around the town. You can also give each of them a few blocks and they take turns in contributing to put up one unique building. The list on how to deal with the blocks goes on and on. It just depends on the teacher’s creativity. This entry was posted in Educational Materials, Teaching Ideas on October 10, 2011 by admin.